NEW YORK—Main Street retailers are benefitting from a tabletop product-syncing service offered by Bridge, an e-commerce platform that includes file sharing and a social network. 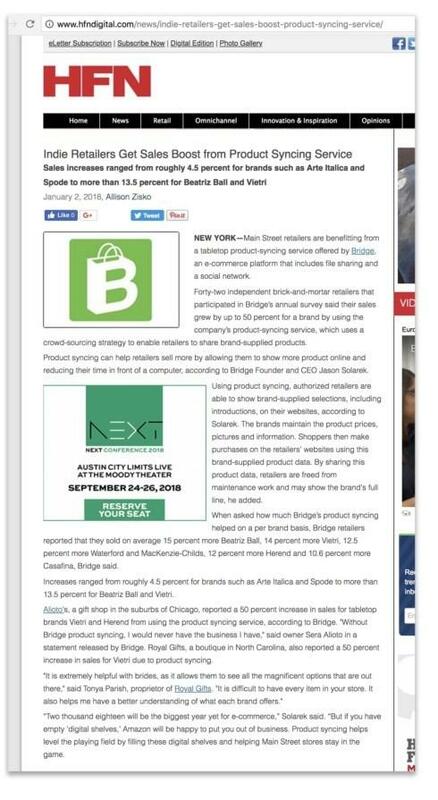 Forty-two independent brick-and-mortar retailers that participated in Bridge’s annual survey said their sales grew by up to 50 percent for a brand by using the company’s product-syncing service, which uses a crowd-sourcing strategy to enable retailers to share brand-supplied products. Product syncing can help retailers sell more by allowing them to show more product online and reducing their time in front of a computer, according to Bridge Founder and CEO Jason Solarek. Using product syncing, authorized retailers are able to show brand-supplied selections, including introductions, on their websites, according to Solarek. The brands maintain the product prices, pictures and information. Shoppers then make purchases on the retailers’ websites using this brand-supplied product data. By sharing this product data, retailers are freed from maintenance work and may show the brand's full line, he added. 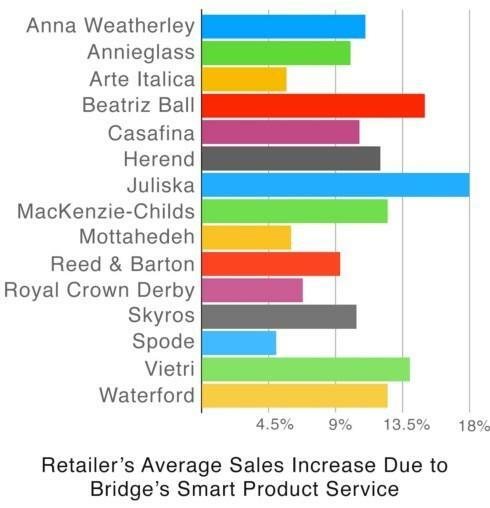 When asked how much Bridge’s product syncing helped on a per brand basis, Bridge retailers reported that they sold on average 18 percent more Juliska, 15 percent more Beatriz Ball, 14 percent more Vietri, 12.5 percent more Waterford and MacKenzie-Childs, 12 percent more Herend and 10.6 percent more Casafina, Bridge said. Increases ranged from roughly 4.5 percent for brands such as Arte Italica and Spode. Alioto's, a gift shop in the suburbs of Chicago, reported a 50 percent increase in sales for tabletop brands Vietri and Herend from using the product syncing service, according to Bridge. "Without Bridge product syncing, I would never have the business I have," said owner Sera Alioto in a statement released by Bridge. Royal Gifts, a boutique in North Carolina, also reported a 50 percent increase in sales for Vietri due to product syncing. "It is extremely helpful with brides, as it allows them to see all the magnificent options that are out there," said Tonya Parish, proprietor of Royal Gifts. "It is difficult to have every item in your store. It also helps me have a better understanding of what each brand offers." “Two thousand eighteen will be the biggest year yet for e-commerce,” Solarek said. “But if you have empty 'digital shelves,’ Amazon will be happy to put you out of business. Product syncing helps level the playing field by filling these digital shelves and helping Main Street stores stay in the game.